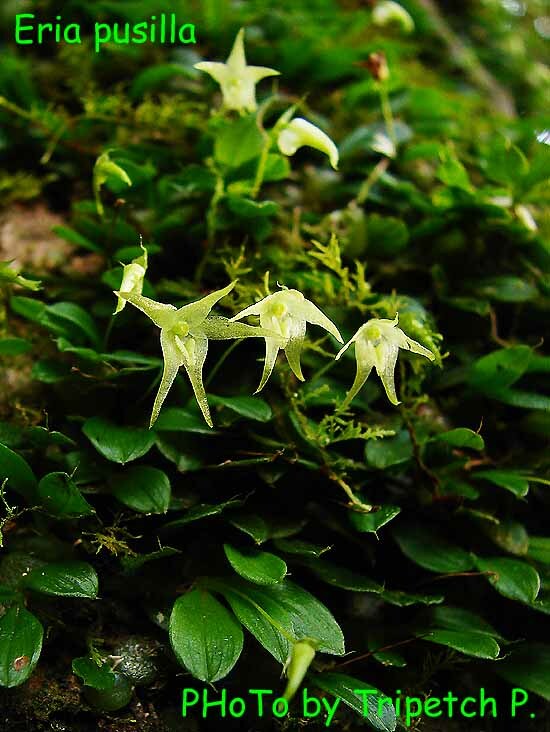 Found in Fujian, Guangdong, Guangxi, Hainan, Xizang and Yunnan provinces of China, Hong Kong, Assam, eastern Himalayas, Myanmar, Thailand and Vietnam on damp rocks in dense forests or sheltered sides of vertical rock faces at elevations of 600 to 1500 meters as a mini-miniature sized, warm to cool growing lithophyte with a long creeping, slender rhizome giving rise to .8" to 2" [2 to 5 cm] between each usually pairs of nearly subglobose to compressed globose pseudobulbs enveloped by reticulate, membraneous, sheaths and carrying 2 to 3, obovate-lanceolate, obovate to subelliptic to orbicular, 3 to 6 main veined, awned to obtuse, rounded to subtruncate, apicaulate apically, narrowing into the articulate, petilolate base leaves that blooms in the fall on a .4 to 2" [1 to 5 cm] long, 1 to 2 flowered inflorescence with ovate, shortly aristate to acuminate floral bracts. Very similar to E sinica but this one differs in the longer sepals and petals. They are found in the same locations in Hong Kong.